Makin' bacon really isn't hard at all; the hardest part is waiting for it to cure and smoke! I usually start this recipe off by purchasing 2 full pork bellies from my local butcher; which, I then cut into halves or thirds depending on the overall length of the bellies. Next, I take 1 1/2 Tbsp of curing salt and rub it into each side of the bellies. 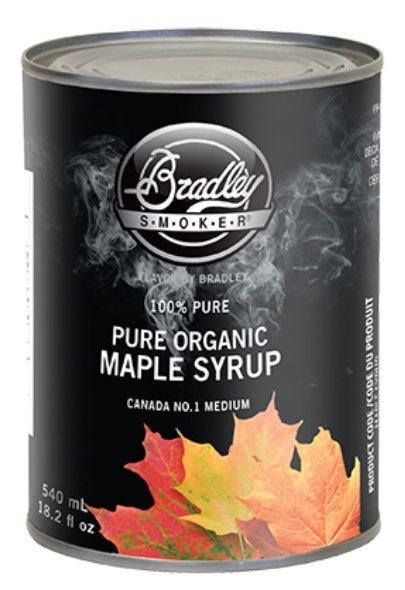 Once the salt is all rubbed in, I pour Bradley Smoker Pure Organic No.1 Medium Maple Syrup (https://www.lodestaroutfitters.com/smokers-accessories/maple-syrup) over each of the bellies and seal my marinating containers. 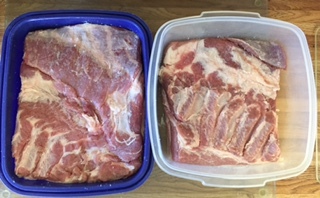 Two cans of the maple syrup is enough for 2 full pork bellies. The bellies are now ready to be put in the fridge to marinade/cure, flipping daily for a minimum of 1 1/2 days per pound of belly. I usually do mine for 5 days. Once the bellies have finished marinating/curing...it's time to spark up the smoker! Before I hang my bellies in the smoker, I take paper towels and pat them dry. This helps reduce the amount of dripping mess in the bottom of the smoker. I then smoke my bellies in my 6 rack Bradley Smart Smoker (https://www.lodestaroutfitters.com/smokers-accessories/bradley-smart-smoker-6-rack) @180 degrees F for 2 hours then increase the temperature to 250 degrees F and smoke until they reach an internal temperature of 160 degrees F which can take anywhere from 8 hours up to 12 hours depending on the temperature outside at the time of smoking. 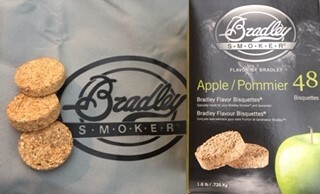 I always plan on using a box of 24 Bradley Smoker Bisquettes (https://www.lodestaroutfitters.com/smokers-accessories/apple-bradley-flavour-bisquettes) as my smoker is set to advance 1 bisquette every 20 minutes. Suggestions for bisquettes that go well with pork are: Alder, Apple, Cherry, Hickory, Jim Beam, Maple, Mesquite, Oak, Pecan & Whiskey Oak. When the bacon is finally ready, slice, cook and enjoy! I like to slice the rest of the bacon up and vacuum seal it with my FoodSaver, wrapping 12 slices per package.